I was contacted by a German teen who goes to school in the vicinity of the liberation site of the Train Near Magdeburg. She, her class, and her teacher are working with others to establish a memorial to the survivors to be dedicated in spring 2020 for the 75th anniversary of the liberation. They know of some elder Germans who were alive at the time of the liberation, one of whom struck up a friendship with a Greek survivor. When Johanna wrote to me about him, I immediately recognized him, as some years ago I wrote about him, and his interviewer, David Boder. He was interviewed immediately after the war in Paris. Boder puts his name as Mene Mizrahi or Manis Mizrachi. Here is Johanna’s appeal for information. Leave a comment below if you can help; you don’t have to add your email publicly, I will still be able to have her contact you directly if need be. My name is Johanna and I am a 17-year-old student from Wolmirstedt, Germany. Together with a few other students and my history teacher, Mrs. Karin Petersen, I am currently working on a project to remember the story of the “death train” stranded in Farsleben, which is a part of Wolmirstedt. In between many other events, our major goal is to obviously raise awareness to what happened on the 13th of April 1945, and to establish a memorial in Farsleben, so that nobody will ever forget this unique and extraordinary story. Part of our project is the organization of a series of events to remember all kinds of different stories from different survivors who were on the train. With this in mind we already organized a reading at our local museum with texts out of the books by Hilde and Shmuel Thomas Huppert, and we would like to do such an event again, on April 13 this year, where we want to fill the inhabitants of Wolmirstedt and Farsleben with enthusiasm for another story from the train near Magdeburg. We are planning on dedicating this day to Mimi Misrachi, one of the survivors who were on the train and developed a friendship with a woman called Gisela Miesch, who was 19 years old at that time. Mrs. Miesch is still alive today and remembers the events pretty well, but Mimi Misrachi left town shortly after the liberation and she never heard from him again. Although he wanted her to come with him, she did not want to leave her parents and stayed in Farsleben. When he left he gave her a small angel made of wax and a photo of himself with the words “You will always be in my heart” written on the back of it. We would like to remember him and his story with this event; unfortunately there is not much we know about his life and his whereabouts today, if he is still alive, and it is very hard to find out anything. So what we know about him is that he was born on January 17, 1922 in Thessaloniki, he is also known as Mimis, Manis Mizrachi or Nissim, his father was Oscar Misrachi (born on May 5, 1882 in Thessaloniki and died on April 19, 1945 in Farsleben), his mother was Sara Misrachi (born on April 5, 1892 in Adrinople and died on May 11, 1945 in Hillersleben) and his family was arrested on March 25, 1944 in Athens and deported to Bergen-Belsen on April 2, 1944. They were then liberated on April 13 in Farsleben and on July 10, 1945 Mimi Misrachi arrived in Paris. We also know about an interview between David P. Boder and him on August 12, 1946 in which he talks about his experience [see link above]. Our last information about him is that he probably still lived in Paris in the sixties, but we don’t know much about his life after the liberation, and that is where we need the help from all of you. If anybody has got any information about Mimi Misrachi or a family member who might still be alive today, we would be extremely grateful if you could contact us and help to remember his life and incredible story. Thank you so much for your help and if you do have any information, then please comment below and we will be in touch! Gisela Miesch is one of the contemporary witnesses who can report on the concentration camp train stranded at Farsleben. She never forgot an encounter. When a train stopped in Farsleben on April 12, 1945, the world stood still briefly. Inside were 2,500 Jews who spent a day in fear until freed from the Americans. The Farslebener Gisela Misch could see the train from her home and helped with. In the process, she met a man who could not forget her time of her life. And she received a small gift, an angel that accompanied her for decades. Her story told the today 92-year-old two members of the Wolmirstedter club “stranded train”. Anette Pilz, museum director in Wolmirstedt, and Karin Petersen, a teacher at Wolmirstedter Gymnasium, visited the contemporary witness in their present home town of Stade (Lower Saxony) and let them tell what happened over 70 years ago – and she remembers, as if the days of horror are just beginning been yesterday. When the concentration camp train that was traveling from the concentration camp Bergen-Belsen to Theresienstadt stopped at the end of the garden in Farsleben, Gisela Miesch lived with her parents and 13 people under one roof. They were refugees who were quartered with them. The train – Miesch speaks of “cattle cars” – was noticed, she went to look. In it sat emaciated people begging for food. But the armed patrol discouraged the 19-year-old. It was only later that they learned who was on the train. On April 13, the Nazi patrol disappeared, the American troops liberated the people on the train. The rescued were distributed in the village. Gisela Miesch also took care of the Jews and helped in a kitchen. She stood alone at the saucepan when she addressed a young man. The Greek Nissim Mizrachi, from her until today called “Mimi”, had lost his father during transport. He had died of typhus in Farsleben. He was to lose his mother a short time later in Hillersleben. He spoke German, English and French and had studied medicine in Greece for several semesters. 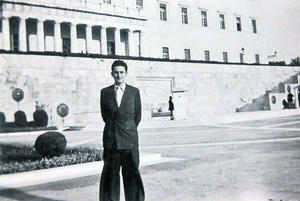 Gisela Miesch made friends with the young Greek, “although one was a stranger,” as the eyewitness describes. After a few days, Mimi told her to pack her bags and come to the West. But the Farslebener [could not]: “I lost two brothers in the war, I could not leave my parents alone with house and yard.” Mimi gave her his talisman, an angel made of hard wax and a photo of himself in his hometown Athens was recorded. On the back is written: “Always in your heart”. These are the two things that Gisela Miesch has saved over the years. Every year, the little angel was hanging by the Christmas tree. Each year, the worn wax reminded her of the days of April 1945. Every year the uncertainty of how Mimi spent his life. Their paths never brought the two together again. She never did any research, never wrote, but never forgot him. And someday, a few years ago, the guardian angel left her. When she moved to the retirement home, he was lost and with him, the picture. When the eyewitness talks about Mimi today, her face is painfully distorted. She remembers every detail, knows the times and addresses of those days. The memories have burned themselves into the memory of the then 19-year-olds. “History will not let me go. I’m carrying [it] with me all my life, “she says. Nevertheless, life had to go on. Gisela Miesch married a civil engineer, had a daughter. In 1996, she and her husband moved to Stade, to [be with] their daughter and their family. The place changed, but the memories remained. Others did not want to know about the concentration camp trains; the memories of the witnesses were too cruel. Several times Gisela Miesch has told her story for posterity. … The sound recordings and images of the contemporary witness are to be part of an exhibition to be created in the course of the 75th anniversary of the liberation in the coming year. There, people like Gisela Miesch are given a voice – so they will not be forgotten.